Among high-end cyclists and racers, Bianchi’s signature Celeste-colored paint is a finish that warrants instant recognition. Currently the frame color used by the LottoNL-Jumbo WorldTour team, the eye-catching hue can now be seen on the dirt roads, as they have entered the world of dual-purpose bikes with the Impulso All Road. Voted at last year’s Interbike as the Innovation Award winner, Bianchi has obviously done something right, as it turned many heads and gathered attention at the largest bicycle trade show in the U.S. 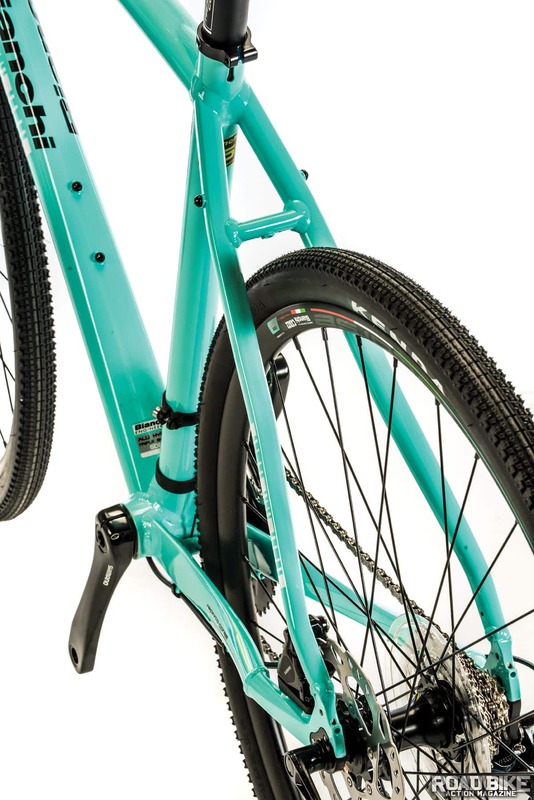 The aluminum frame paired with the carbon fork stands out with the signature Bianchi Celeste color. The Impulso starts with a triple-butted frame that has gone through their THT (triple hydroformed tubing) process as well. Front- and rear-wheel clearance will allow up to a 40mm tire. The front fork is a flat-mount disc with a 12x100mm thru-axle, while the rear wheel has a 12x142mm thru-axle. The 12mm thru-axles both have twist handles, which means the scenario of fixing a flat and not having an Allen wrench to remove the axles is not a concern. The bottom bracket is a Shimano Press-Fit BB72. The aluminum-framed Bianchi Impulso is complemented by a carbon fork, allowing for up to a 40mm tire. To expedite the all-road theme, you’ll find fender mounts on the front fork and rear seatstays. Internal cables route through the downtube of the frame and front fork to offer a very clean look. The welds are rather apparent and on the larger side throughout the frame. With the Shimano name found on the drivetrain and brakes, you can always rest assured that the parts will deliver good performance. For true all-road use, running two chainrings makes sense, and you’ll find a compact 50/34t set mated to an 11-32t cassette to provide the easy-on-the-knees gearing. The stem, (flared) handlebar and seatpost are all Bianchi’s own in-house Reparto Corse alloy parts. A Selle San Marco saddle tops things off. The aluminum wheels share the in-house Reparto Corse branding. It’s nice to see that the wheels are tubeless-ready. Kenda takes care of the tires with a 35c Flintridge sport. One of the biggest differences of riding on the road versus riding on more multi-surface terrain is that the bike’s weight is more apparent with the latter. At 22 pounds, the Impulso All Road 105 tips the scales on the heavier side. With the slower speeds and accumulation of dirt, which you don’t quite glide over, you also feel the weight in the aluminum Reparto Corse wheels. An upgrade here would give the Bianchi a drastic change in performance and nimbleness. The bike’s geometry offers a comfortable, upright position to provide confidence when riding over rough terrain. Maintaining its utilitarian pedigree, Bianchi wisely added fender and rack mounts to make the bike as versatile as possible. The compact-bend handlebar has a nice touch, as they have a flare, but the compact size didn’t make it feel as though you’re riding a wide load. The Shimano 105 hydraulic disc brake hoods are on the longer side but do give you some more room for your hand position, as you tend to adjust your hands a bit more while riding the rougher terrain than you normally do when just sitting on a road bike. Stopping was never an issue with the All Road, as Shimano’s entry-level 105 disc matched with 160mm rotors will slow you down quickly. The aluminum frame paired with aluminum parts (and the large diameter seatpost) kept any ride-friendly compliance to a minimum. With proper tire size always being a topic for discussion on these range of dual-purpose bikes, it was nice to see that the 35mm Kenda tires still had plenty of room to grow. 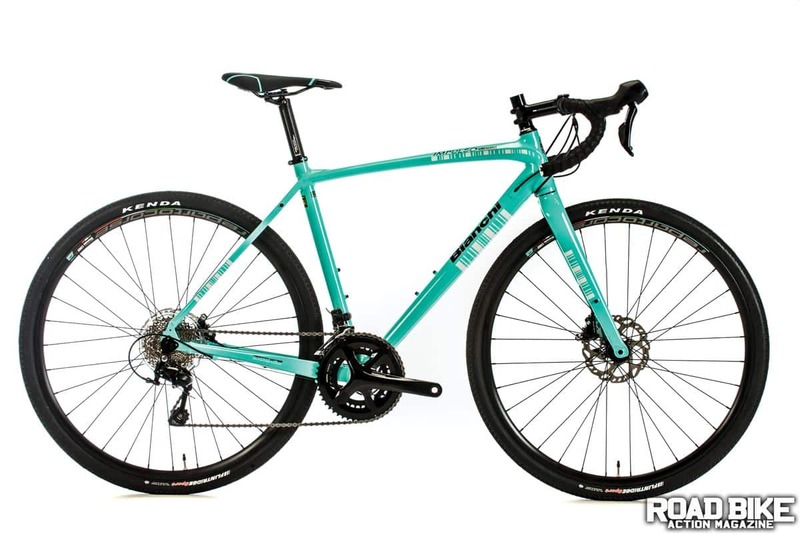 With the current trend in the industry showcasing the popularity of consumers choosing to ride more multi-surface terrain, it’s great to see a historic brand such as Bianchi jump into the fold with an attractive, entry-level price point (for $400 less, Bianchi offers the All Road Tiagra that uses the same frame with lower-spec’d Shimano components). Other than feeling hindered in acceleration by the weight, the Bianchi still offered up a good time. Maybe it’s just us, but a splash of wet dirt on the Celeste frame offered up a great contrast and made the bike look right at home. 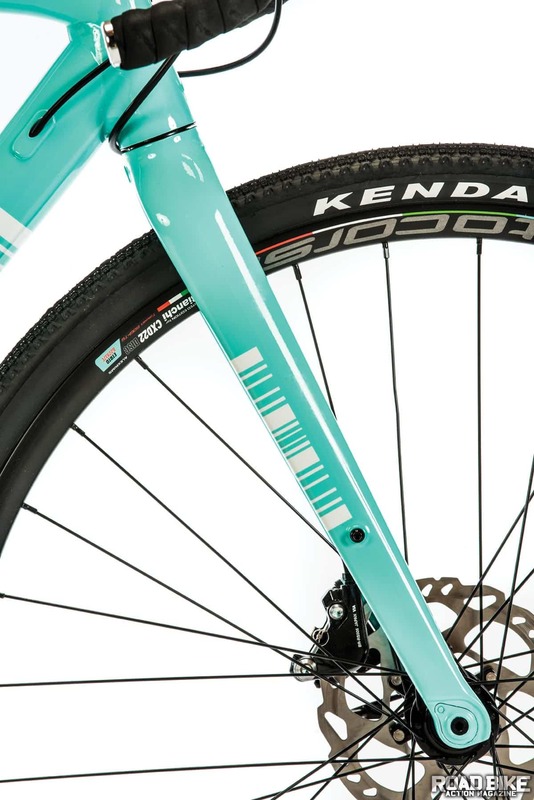 The Bianchi rode smoothly on the road thanks to the Kenda tires. Some of our test riders aren’t big on the flared handlebars found on other gravel bikes, but the compact size on the Impulso provided a much better feel.